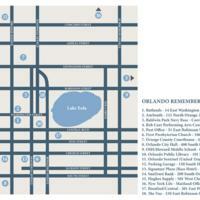 A map of exhibits created by Orlando Remembered. The Orlando Remembered Committee of the Historical Society of Central Florida, Inc. was created to "showcase artistic renderings of the time depicted, with artifacts and historical memorabilia from the location in an effort to preserve the memory of Orlando's history while acknowledging the potential of the City's future." Various exhibits around Orlando memorialize the history of the blocks at which they are located. Original color map by Orlando Remembered. Digital reproduction of original color map by Orlando Remembered. Originally created by Orlando Remembered. 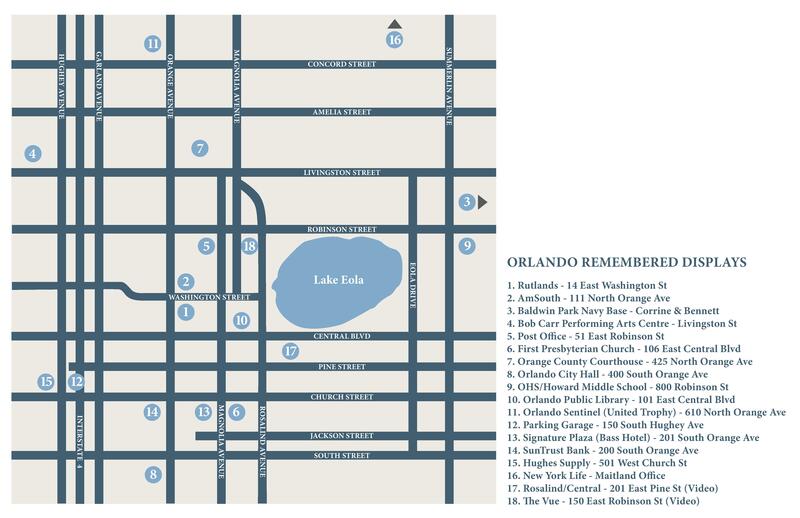 “Orlando Remembered Exhibits Map.” RICHES of Central Florida accessed April 21, 2019, https://richesmi.cah.ucf.edu/omeka/items/show/4235.